Mainland Air's new service from Oamaru Airport has attracted interest from around the country and as far abroad as Scotland. The Dunedin-based company was ''all on track'' for a June 4 launch of its Oamaru-to-Christchurch service and its future looked positive, Mainland Air chief executive officer Philip Kean said yesterday. ''We've had quite a lot of inquiries from all over New Zealand,'' he said. Interest had also been expressed from Scotland. Yesterday, there were still seats available on the first flight, but with a week to go, Mr Kean said it could easily fill up. From Wednesday next week, there will be morning and afternoon return flights between Oamaru and Christchurch three days a week. On Mondays, Wednesdays and Fridays, morning flights will leave Oamaru at 7.30am and return at 9am, while afternoon flights from Oamaru would leave at 4.30pm and return at 6pm. There will also be an afternoon flight on Sundays, leaving at 4.30pm and returning at 5.30pm. A one-way ticket between Oamaru and Christchurch will cost $200. Mainland Air will permanently base a Piper Chieftain aircraft in Oamaru from Tuesday and Sven Thelning, of Oamaru, will pilot the service. A plan is in jeopardy to re-establish a Masterton air link using a Vincent Aviation Australia aircraft after the airline announced it was going into receivership. The Darwin-based company yesterday confirmed up to 120 staff were to lose their jobs in the receivership. Eagle Air, a subsidiary of Air New Zealand, had on February 5 ceased its Masterton to Auckland flights. Masterton businessmen Colin Oldfield and David Borman that month announced plans to use a Vincent Aviation-owned Saab aircraft to re-establish the passenger air service out of Masterton Airport at Hood Aerodrome. The pair had won wide support for their plan and earlier told the Wairarapa Times-Age of hopes that flights would begin in April. Mr Oldfield yesterday said he was unaware Vincent Aviation had gone into receivership and Mr Borman could not be reached for comment. Wellington-based Vincent Aviation's Australian operation has been put in receivership in what the airline says is a bid to shore up its New Zealand business. Vincent ran a fleet of nine leased aircraft and employed 80 people in Australia where it had set up a subsidiary largely to service the mining industry. Chief executive Peter Vincent said the company had spent "millions of dollars" on the operation since 2001 but demand had dropped and attempts to find a buyer had failed. "We've had three prospective purchasers fall through so in the end had no option but to put the Australian arm of the company into receivership. It wasn't forced on us by a bank or anything." Vincent said some passengers who had paid in cash would become an unsecured creditor but that would be a "very small proportion" of passengers would be affected. "The business has been running at a loss for some time and it got to the stage where we couldn't continue to prop it up. Trading conditions had become increasingly difficult." He blamed the slowdown in mining and also high compliance costs. "We're not the first airline that has failed and won't be the last probably.' Vincent's Australian operations were based in Darwin and had just been awarded a scheduled passenger route from Sydney to western New South Wales. In New Zealand the company flies the Life Flight Trust air ambulance, provides charter aircraft for Air New Zealand and private operators. He said the failure in Australia had put pressure on the business. "I'd love to say it doesn't but the situation in Australia has put a strain on New Zealand operation for a long time which we're trying to alleviate. We're hopeful that without that loss that the New Zealand company can continue. " He said the New Zealand operation was profitable. "It is separate and the reason we've done this is to ensure the continued viability of the New Zealand operation. It's going to take a little while for people to get confidence back in us." Vincent was set up in 1990. Darwin-based Vincent Aviation (Australia) is in the hands of receivers and all flights by the airline have been cancelled. Andrew Fielding and Gerald Collins of BDO were yesterday appointed receivers and managers to Darwin-based company. The is not word on the immediate future of the company or if flights will resume. BDO said in a statement it has commenced an assessment of the financial position of Vincent Aviation (Australia) to assess its future viability and will work with management and major stakeholders and regulators during the process. The company is wholly owned by New Zealand-based Vincent Aviation Limited and has satellite bases in Brisbane and Sydney. The Australian company operates nine medium-sized turbo prop passenger aircraft including Beechcraft 1900s and SAAB 340s, and employs approximately 80 staff. Mr Fielding said a range of factors, particularly market conditions, had contributed to the current situation facing the company. “The prudent step was taken by the company’s management to cease trading to enhance the recoveries to all creditors. The company has cancelled all flights and customers should make alternative travel arrangements,” he said. A New Inter-Provincial Air Service? Tauranga Airport could be in line for an extra 11 domestic flights a week, if regional development plans between the city and Palmerston North Airport take off. The two airports are currently in talks over the proposed regional relationship and are looking to foster economic development through domestic flights. Palmerston North Airport chief executive, David Lanham, says Tauranga is very much on the airport's radar as an option for boosting traffic and supporting regional growth. The recently appointed chief executive is part of a team that aims to convince Air New Zealand to reinstate Palmerston North to Nelson flights – something he is confident can be replicated with Tauranga Airport. Eleven domestic flights currently travel between Palmerston North and Nelson each week, which includes two flights daily Monday through Friday to cater to business traffic, plus one on a Sunday. David sees building stronger links to main centres and other regions as a safer bet than uneconomical international flights. “We believe our focus should be on regional development – so domestic development first and foremost. We are about economic growth and we see the best way to do it is through promoting domestic services. “Everyone wants international flights [and] we had them here up until 2008. But the bottom line is they're just not economically viable.” Manager of Tauranga Airport, Ray Dumble, says discussions between the two airports and Air New Zealand have been ongoing but there is no timeframe for when the additional flights could be introduced. “Initially they obviously saw the Nelson-Palmerston route as viable and our one was put on the back burner a bit. But it's obviously time to look at it again.” Tauranga Airport is the fifth busiest controlled airport in New Zealand and capable of handling large aircraft such as Boeing 737-800 and Airbus 320. Ray says the proposal's biggest hurdle is timing, with 15 flights per day (including return flights from Auckland, Wellington and Christchurch) already on the airport's books. The advantages of scheduling additional flights between the two airports include inbound and outbound traffic being able to bypass Auckland to get to the two cities; something that will take pressure off the three hubs of Auckland, Wellington and Christchurch. Air New Zealand is planning to increase the number of seats available on Nelson to Auckland flights over the next year. The 9.1 per cent increased capacity would equal more than 30,000 additional seats a year in both directions, and will happen as a result of streamlining aircraft used by the three Link operators. That includes re-positioning the larger 68-seat ATR72 aircraft which are gaining a greater presence in and out of Nelson, the new head of Air Nelson, Kelvin Duff, said. The company also plans a four per cent increase in seat capacity from Nelson to Christchurch. Duff is a former aircraft engineer who has been with Air New Zealand for 24 years. He and his family moved from Auckland this year when he was appointed head of Air Nelson. It followed the appointment of Sarah Williamson as general manager of Air New Zealand Link operations. She manages the three regional airlines, Mt Cook Airline, Air Nelson and Eagle Air from her base in Christchurch. Duff will oversee Air Nelson's operations from the Nelson offices. The combined turbo prop fleet operated by the three Link operators is made up of 23 Q300 aircraft operated by Air Nelson, Eagle Air's 18 Beech 1900D aircraft, and Mt Cook's 14 ATR72s. The three Air New Zealand Link operators have formed closer ties in recent years, with advantages found in being able to share aircraft as demand dictates, Williamson said. Duff said his role will be to oversee Air Nelson operations and the team of around 350 staff spread over pilots and cabin crew, corporate and engineering staff. Duff said he was aware of Air Nelson's place in the community and its origins as a strong local commuter airline. "One of my roles is to try and capture the history and pride of where Air Nelson came from," he said. Duff said Air Nelson, which operates under the Air New Zealand banner, had a strong presence in the regions but he said the commuter airline industry was reasonably competitive. "From a New Zealand perspective there are numerous small operators. "We have a strong presence in the regions but we do offer a lot of frequency," he said in response to complaints about airfares and whether a monopoly situation existed. Duff said scheduled services provided by the two other commercial commuter operators (Sounds Air and Air2There) in and out of Nelson meant the region was served by several options, particularly across Cook Strait. Duff said average airfare increases since 2010 were in line or below inflation rises. "The company has made a big investment and commitment to the ATRs which had meant the Q300s [operated by Air Nelson] have been re-deployed on other routes." Air Nelson Technical also provided maintenance services on the ATR fleet. 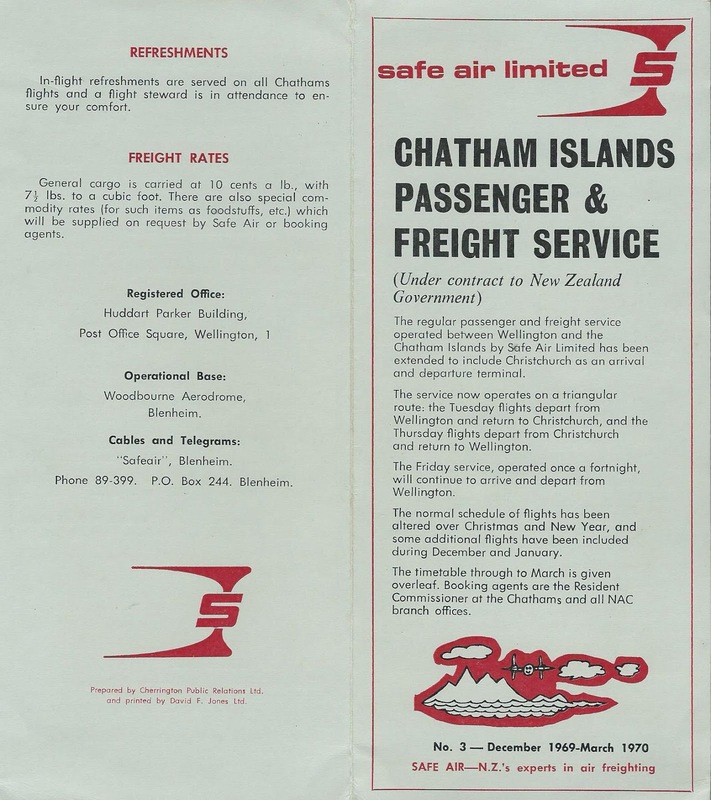 On the 6th of October 1967 it was announced that Straits Air Freight Express Limited, had been awarded the Internal Affairs contract to provide a seven-year, weekly air service to the Chatham Islands. The service, which was to begin in 1968, was to operate between Wellington and the Chatham Island’s Hapupu airfield with Bristol Freighter aircraft. NAC was to provide agency and management facilities and prospective passengers would be able to buy through tickets for the Chatham Islands from any NAC office. 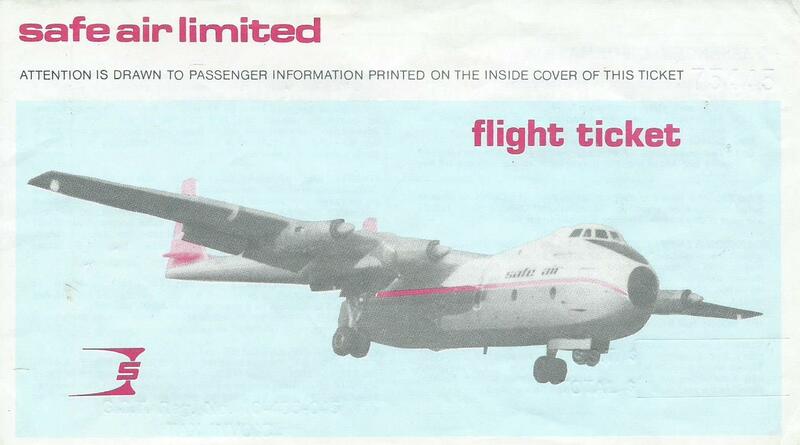 On the 31st of October 1967 Straits Air Freight Express changed its name to Safe Air. To mark this a booklet was published entitled, What’s in a Name? which concluded with a statement about the proposed Chathams’ service: Under a contract with the Internal Affairs Department we will be operating a passenger service for real live humans after Christmas. We treat our livestock well – but our passengers can look forward to home comforts too. Two Bristols are being converted to take passenger capsules, a new concept in mixed passenger freight loading. The “passenger capsules” were designed to give a much higher standard of passenger accommodation than normally have been expected in a Bristol Freighter with its unlined hold. 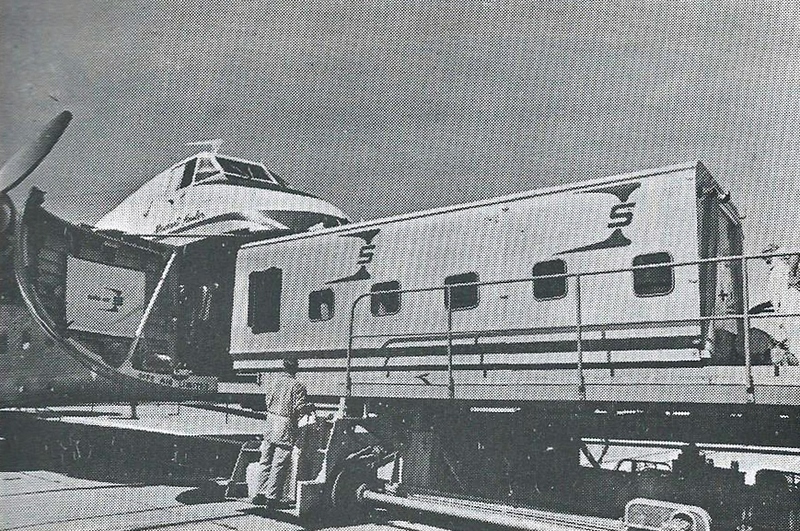 The passenger capsules were 20 feet long, 8 feet wide and 6 feet high and were designed to slide into the hold of the Freighter in the same manner that Safe Air’s freight cargons used. In 1970 Safe Air issued a booklet on the company’s role in New Zealand’s air transport that gives a good description of the capsules. The capsules were built in two sizes – one for twenty passengers, the other for twelve. They were completely self-contained with comfortable airline seating, a galley for in-flight refreshments, carpeting, storage racks, cold and warm air circulating systems, a toilet and emergency equipment. To achieve ultra-light weight, Safe Air engineers in conjunction with Glenroy Products of Blenheim evolved a novel combination of materials to form the capsule. Aircraft alloy was used for the outer skin, a light formica material provided the cabin lining and between these two surfaces was sandwiched a practically weightless polystyrene with high thermal-retaining qualities. Much of the credit for the capsule is given to Safe Air’s chief pilot, Captain Keith Beattie, DFC, who conceived the idea of utilising a capsule for transporting passengers. The design and manufacture of the capsule was directed by Mr Jacek Kundycki, the company’s engineering manager. The capsules weighed less than a ton and could be loaded in minutes. A stewardess was provided for the comfort of passengers on the two to three hour journey to and from the Chathams. At this time Safe Air had eleven Bristol Freighters and two of these, ZK-CLT and ZK-CRK, retained their fuselage windows for the passenger operation. Both were fitted with DME and HF radio for the 770 km flight to the Chathams. Press statements made it clear that the service was principally for passengers but the aircraft would also have a limited amount of space available for the carriage of miscellaneous small cargo and other goods such as spare parts for the fishing fleet. For the nine years prior to Safe Air operating its regular service to the Chathams the islands had been linked to the mainland by the Royal New Zealand Air Force. Sunderland flying boats were used until the 22nd of March 1967 when Sunderland NZ4113 took off from the Te Whanga Lagoon on the final flight to Wellington. Following this RNZAF Bristol Freighters provided regular flights to the Chathams. The last RNZAF flight was flown by Bristol Freighter NZ5904 on the 19th of January 1968. The RNZAF had been able to operate to Hapupu airfield under less stringent requirements than a civil operator and handover from the Air Force to Safe Air meant the grass runway at Hapupu had to be extended from 1035 to 1425 metres. 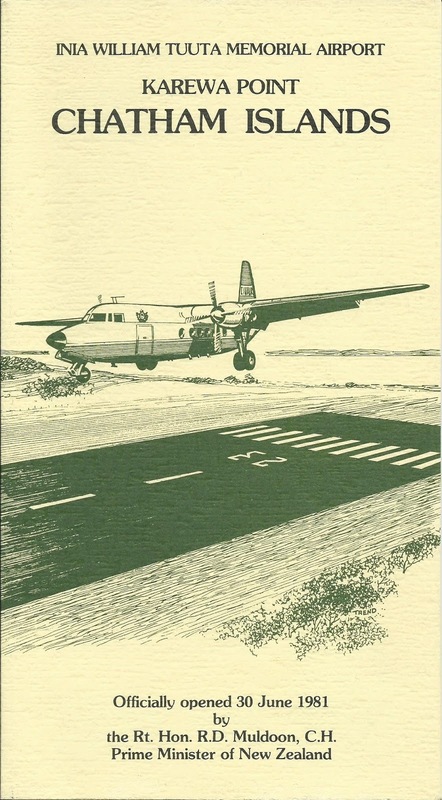 This work was completed in September 1967 though it took some months for the grass service to be consolidated to the point of allowing the licencing of the runway extensions. On the 23rd of January 1968 Safe Air Bristol Freighter ZK-CLT made a route proving flight to the Chathams carrying a ton of cargo. On board were Safe Air and Department of Civil Aviation Authority officials. The outbound flight time was 2½ hours with the return being 3 hours, 10 minutes. A second proving flight with the capsule installed was made on the 25th. Safe Air’s first scheduled flight to the Chathams was operated by Bristol Freighter ZK-CLT on the 30th of January 1968 with 12 passengers flying out to the Chathams. ZK-CLT flew the initial services while ZK-CRK was modified for passenger use a few months later. On the 24th of February 1968 a Safe Air Bristol Freighter carried a helicopter and a Cessna 180 ZK-BWK belonging to Graham Stewart & Co (1965) Ltd to the Chathams in support of the booming crayfish industry. The helicopter was based on Pitt Island and lifted the crayfish pots and reset them while the Cessna 180 flew the crayfish tails to Chatham for freezing and packing for shipment to New Zealand and export to the United States. From the beginning of August 1968 the frequency of flights was increased from one to two a week for a trial period of three months. Between the first flight in January and July 36 flights were made carrying 1147 passengers. The Chatham Islanders were delighted with the new service and saw the opportunities it offered for extending local industry. On the 10th of September 1968 a trial consignment of first grade meat was flown from the Chathams to Wellington. 1000lbs was taken from Waitangi to Hapupu airfield by helicopter before being flown to the mainland. Safe Air made a more auspicious flight to the Chathams the following month. The Governor General, Sir Arthur Porritt and Lady Porritt made an official visit to the islands. After arrival at Hapupu airfield the Vice-Regal party was flown to Waitangi by helicopter. 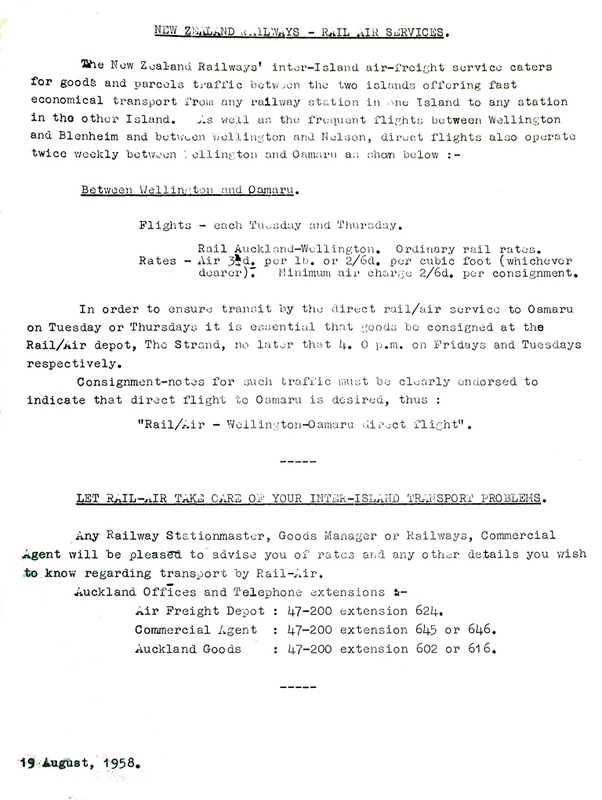 The Chatham Islands flights were further extended from the 1st of April 1969 after which a fifth flight was offered each fortnight. Under this schedule flights were made every Tuesday and Thursday, with an extra flight every other Friday. In February 1968 158 passengers were flown; in February 1969 there were 407 passengers. During the same time freight increased 1000%, this being largely due to the crayfish boom. An airmail parcel service to the Chatham Islands also started, the rate being the same as for internal NZ airmail plus a surcharge of 10 cents per pound. During the winter of 1969 the outlet of Te Whanga Lagoon became blocked flooding the Hapupu airstrip thereby reducing the runway length by 1000 feet. The Safe Air service halted after the flight of the 2nd of July. The following day Tasman Air resumed the passenger service using Piper Navajo ZK-CUF. On the 22nd of July Tasman Air started a twice weekly service from Christchurch. However, this service was quite restricted as the Navajo had to have enough fuel for the return flight so with a pilot and co-pilot only four passengers could be carried from Christchurch and six on the return flight from the Chathams. The Safe Air service resumed on the 29th of July. The airfield was again also closed for a week in September after heavy rain made the runway waterlogged. The state of the Hapupu strip was a constant issue for Safe Air’s Bristol Freighter service. The Tasman Air service from Christchurch prompted Safe Air to explore the possibility of offering a Christchurch-Chatham Islands service. The original decision to use Wellington as the mainland terminus was made by the Internal Affairs Department after a survey of users found that 51% of passengers originated from north of Wellington. Indications were that there was enough demand for a service to and from Christchurch which is where the shipping service operated from. When Tasman Air made application to offer a permanent air service between Christchurch and the Chathams Safe Air made its own application and this was seen as more desirable than the Tasman Air proposal. On the 2nd of December 1969 the Chathams were linked to Christchurch with Bristol Freighter ZK-CLT "Merchant Hauler" under the command of Captain C. G. Fantham flying a Wellington-Chathams-Christchurch service with passengers and mail. The reverse route was flown on the 4th of December, again in ZK-CLT under the command of Captain J. D. Howard and First Officer J. Faircloth. The normal pattern with the five flights a fortnight was each Tuesday a Bristol would fly Wellington-Chathams-Christchurch with the reverse flight being flown on the Thursday. The every second Friday service was operated from Wellington and return. 1970 saw a reduction in flights. This Friday service was dropped from the 1st of April 1970 and from October 1970 the frequency was reduced to three flights week. In addition to these regular flights up to 18 special flights were operated each year to convey school children between Christchurch and the Chatham Islands, and Wellington and the Chatham Islands as well as to cover for other peak travel periods. 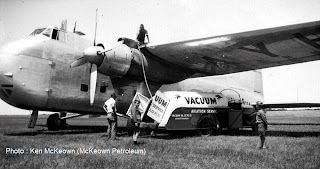 In September 1970 purchased a holding in Safe Air, thus strengthening the company’s viability and in September 1972 Safe Air became a wholly owned subsidiary of NAC. The Bristol normally carried 20 passengers from Wellington and 16 from Christchurch but in 1972 passenger loadings from Wellington were also reduced to 16. This was to reduce the risk of offloading passengers because of weight restrictions in bad weather. At that time there was a steady 75 per cent load factor. 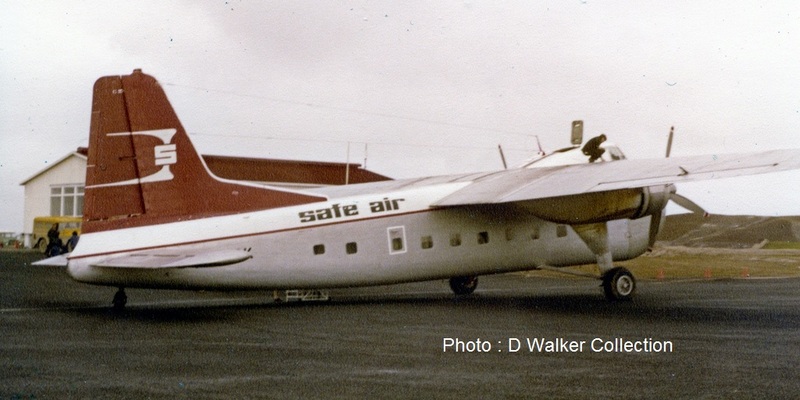 In the year ending the 31st of March 1974, Safe Air’s service to the Chathams made a loss of $42,953. During that year the airline operated 116 flights, and carried 3128 passengers, 33,809lbs of mail and 168,431lbs of freight. 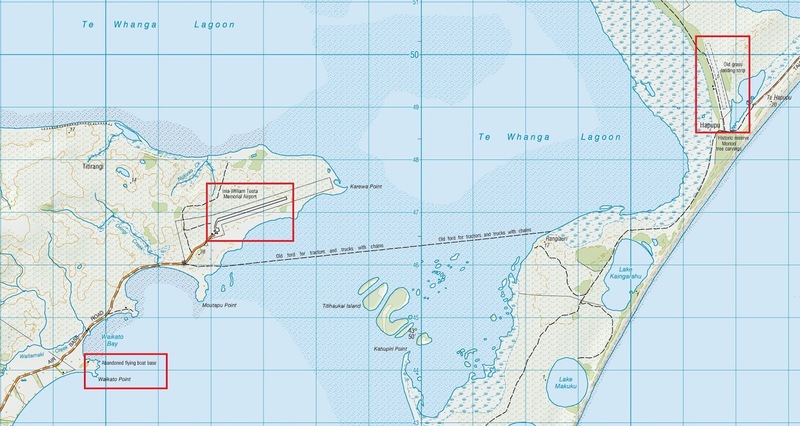 Nonetheless the importance of the air service was undisputed and in mid-1974 the Government approved, in principle, the construction of a new airfield at Karewa Point on the Chatham Islands with the expectation that it would be operational by 1980. 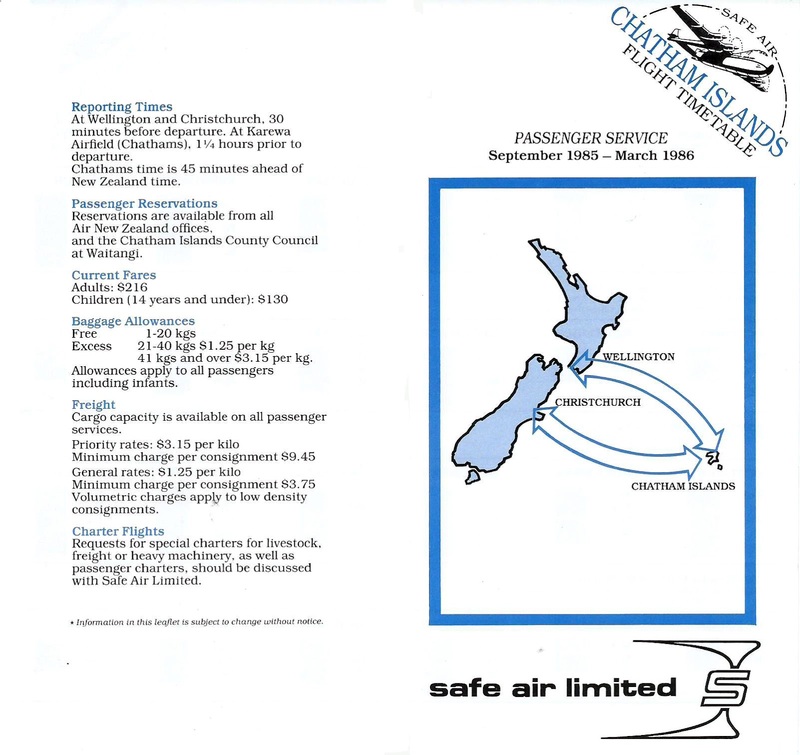 Revenue collected by Safe Air in operating the Chathams service was retained by the company and any shortfall in providing the service was met by the Government. If a surplus resulted in any year, it was to be a credit to the Government. The service, however, consistently operated at a loss as shown in the losses from 1972 to 1977. In 1971 it was suggested that the Christchurch connection be cut as an economy measure. The Air Services Licensing Authority was then of opinion that the Christchurch link should be retained and the regular weekly running from Wellington and Christchurch continued until 1975 when Safe Air, at the request of the Government discontinued regular flights between the Chatham Islands and Christchurch. The Safe Air service to the Chatham Islands was a non-scheduled operation and there was no need for it to approach the Air Services Licensing Authority before the change directed by the Government was implemented. 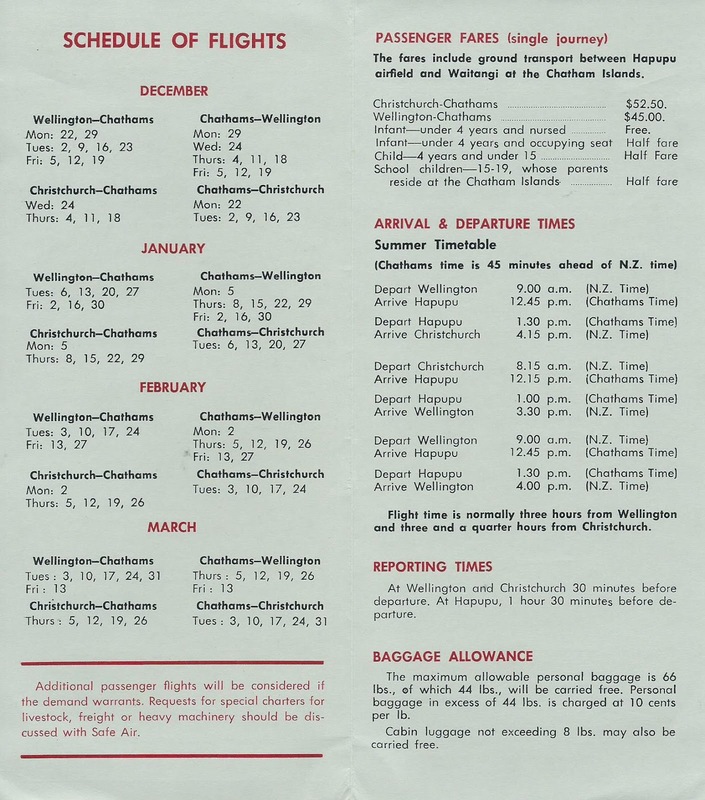 Thereafter it operated two return services each week on a regular timetable between Wellington and the Chatham Islands even though two thirds of passenger traffic originated or terminated in Christchurch. In mid-1977 Titan Air Services applied to the Air Services Licencing Authority to introduce a direct Christchurch to the Chathams service using a Cessna 404 Titan. At the commencement of the hearing the Licensing Authority were informed by the Department of Internal Affairs that consequent on representation from the Chatham Islands interests, the former triangular service which operated Wellington-Chatham-Islands-Christchurch would be reintroduced at an early date provided the Authority approved a revised fare of $88 (up from $77) between Christchurch and the Chatham Islands. 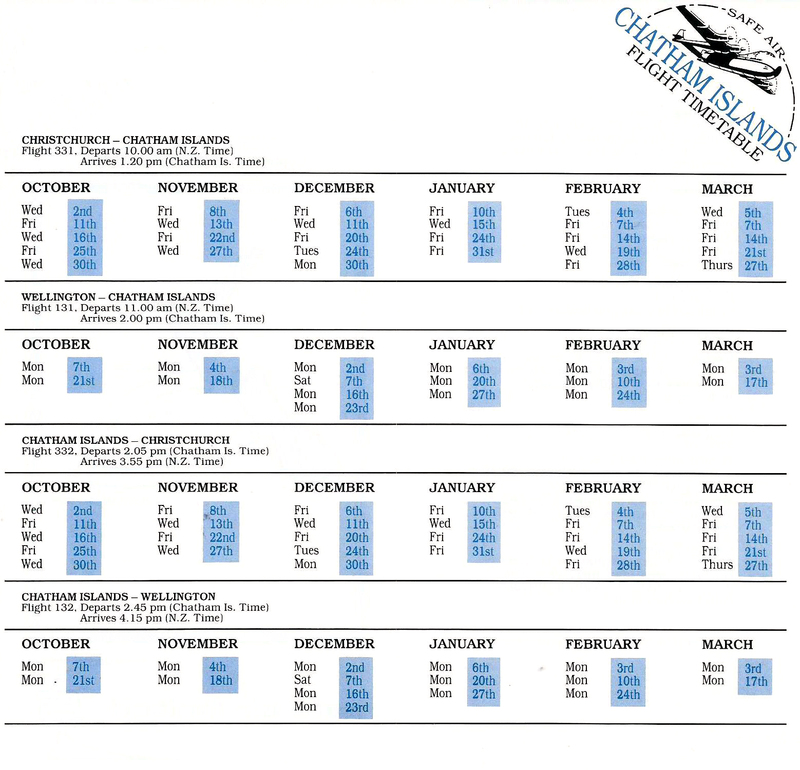 The new timetable would operate one direct flight each Friday between the Chatham Islands and Wellington and a flight each alternate Tuesday between Wellington, the Chathams and Christchurch and a flight every other Tuesday between Christchurch, the Chatham Islands and Wellington. At this stage the Chathams’ business connections and hospital and professional services were largely Christchurch orientated and children undertaking secondary education predominately attended South Island schools. Also, the freight-only shipping service to the Chatham Islands operated out of Lyttelton and these factors undoubtedly kept Christchurch as an important destination for the Islanders. The Government accepted the need for providing an air link for the Chatham Islands but the need it catered primarily for was passengers with freight on a filler basis. The report of Air Service Licensing Authority carried other interesting details. In the year ended 31 March 1977 a total of 3351 passengers were carried on 127 return flights. Of these 637 (19%) were children paying half fare and in addition, it is estimated over 160 non-paying children under 4 years of age were carried. Accordingly an average of 13.1 paying passengers per single trip was achieved. This figure is influenced by the loadings on the outward and return journeys often being out of balance. It is not unusual at the beginning and end of holiday periods to have full loadings on one leg and only a limited number of passengers on the other leg. This factor affects both the economics of the service and when passenger loadings to the Islands are heavy, the quantity of freight which can be taken. 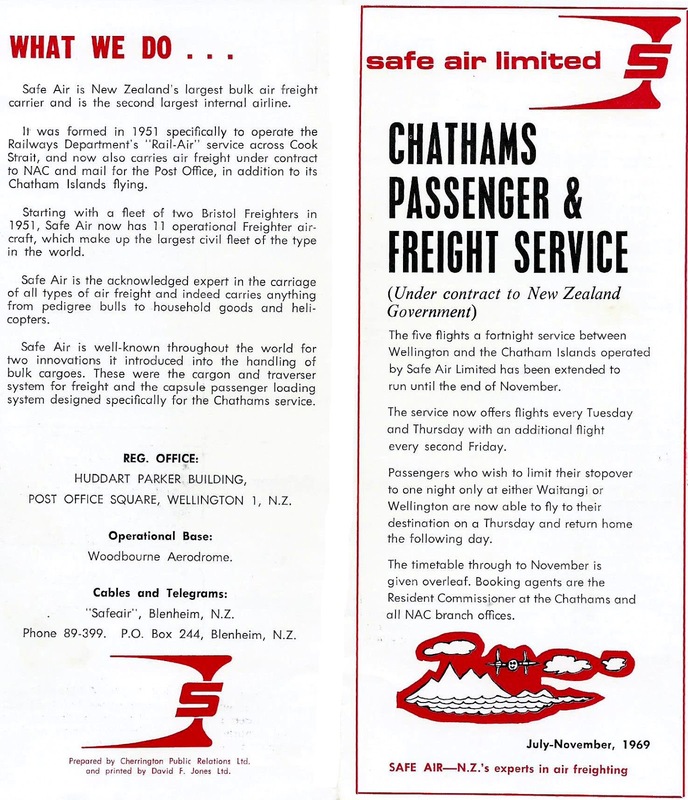 During year ended 31 March 1977 the service carried 12,762 kg of mail (78% or 9954 kg of which was inward to the Chathams) and 83,334 kg of other freight (661 or 55,303 of which was outwards from the Chathams including 19,460 kg of fish and crayfish). Mail was off-loaded on 27 out of the 127 flights operated last financial year. It is accepted that there is more airfreight offering than the present service can cope with. Discussions are being held between the Government and Safe Air Limited with a view to possibly increasing the number of flights. Not surprisingly the Licensing Authority thought that the introduction of a second service would not be helpful to the existing service - “Nor would the proposed service assist in local emergencies in the Chatham Islands. The Bristol’s are available and used for mercy flights as required.” The Authority approved a fare of $88 by Safe Air Limited between the Chatham Islands and Christchurch and the regular services between Christchurch and the Chathams began again on Tuesday the 2nd of August 1977. Safe Air's Bristol Freighter ZK-CRK at Hapupu in the late 1970s. By 1980 construction had begun on the new airport on Chatham at Karewa Point. The Government had planned that Air New Zealand's Friendships would replace Safe's ageing Bristol Freighters when the airfield opened but in November 1980 Safe Air and Air New Zealand jointly suggested to the Government that Safe Air use its Argosy aircraft on the Chathams run when the island's new air strip was completed. Air New Zealand told the Government that it was unlikely to be able to spare its two Friendships that were equipped for long distance flying as these were needed for the Auckland-Norfolk Island run. The Internal Affairs Department which administered the Chatham Islands were unhappy with the Safe Air - Air New Zealand plan, especially when plans to operate Friendships were so far advanced. The Nelson Evening Mail reported that much to the dismay of the Department of Internal Affairs that the uncompleted runway would have to be even longer if Argosies were to be used and this would cost an extra $190,000. It was also found that the Argosies would lose more money on the thrice fortnightly service than the Friendships - a loss which would have to be met by Government subsidies. And finally it would cost $100,000 to build passenger capsules and covert the Argosies to passenger carrying aircraft. 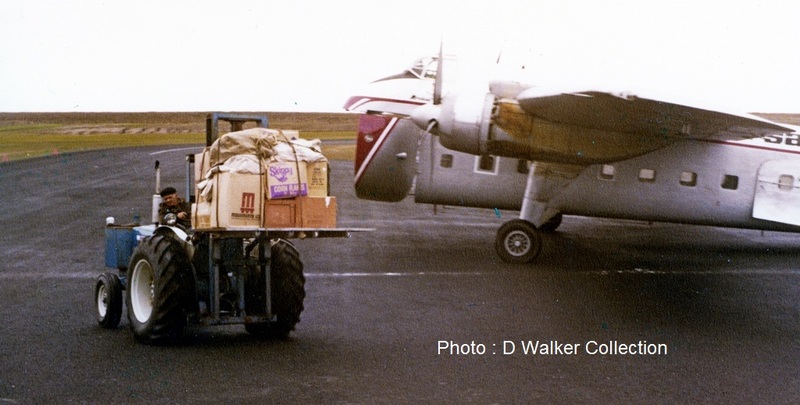 Safe Air argued the Argosies would offer the Chatham Islanders much more air freight capacity. Even though the Government was not happy the decision was announced on the 22nd of December that the Argosies would take over the Chatham Islands run from the Bristol Freighters. On the 30th of June 1981 the new Inia William Tuuta Memorial Airport was opened on Chatham by the Prime Minister, the Right Honourable Robert Muldoon. The first official landing of an aircraft carrying passengers and mail from New Zealand was made by SAFE Air Bristol Freighter ZK-CLT. However, it was to be another year before the Argosy took over the Chathams service. The first Argosy flight was flown from Christchurch to the Chathams by ZK-SAE on the 16th of June 1982. 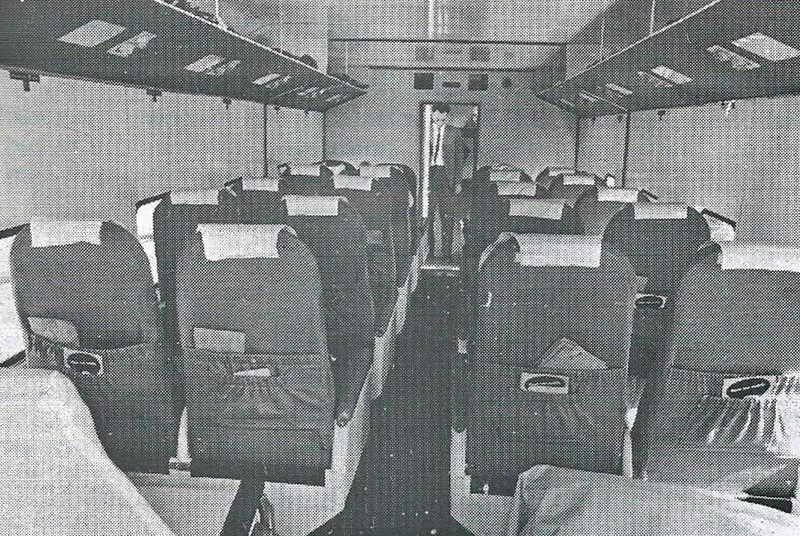 Like the Bristols before them the Argosy housed passengers in a removable 'passenger capsule' with standard Air New Zealand Boeing 737 seating and facilities. The Argosy carried 30 passengers with a stewardess as well as giving increased cargo capacity. The Argosy brought a new level of comfort to the Chathams service. Unlike the Bristol Freight it replaced the Argosy was pressurised, its cabin was considerably quieter and it was faster with the flights from Wellington and Christchurch being reduced by about an hour. The schedule generally saw flights operated three times per fortnight with Christchurch being the terminus for some two thirds of these flights. 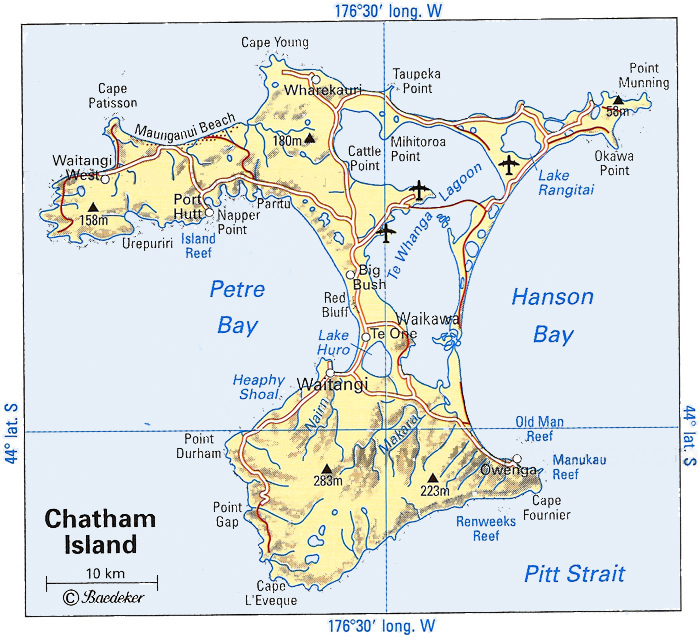 On the 30th of June 1990 the Government stopped the subsidy for the Chatham Island service. 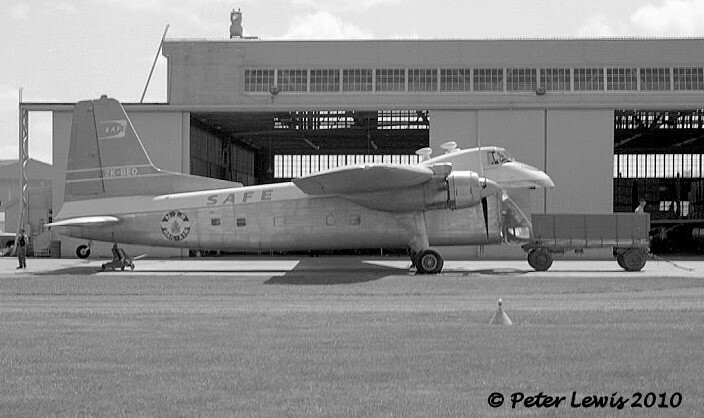 Some seven weeks later, on the 17th of August 1990 it was announced that Safe Air was to close on the 30th of September 1990. The company's general manager, Ron Tannock, said the loss of a major charter contract, the low demand in the air cargo market, uncertainty over the airline's passenger/cargo service to the Chatham Islands and the limited life of the company's Argosy aircraft all had a bearing on the decision. Safe Air's decision to shut down stunned Chatham Islanders who had been faithfully served by Safe Air for 22 years. The chairman of the Chatham Islands County Council, Mr Bunty Preece, was reported as saying the announcement had come as a bombshell. "They have been associated with the island for 22 years and it came as a shock to us all. From our point of view it is quite a loss." Safe Air’s final flight from Christchurch to the Chathams operated on the 27th of September and the final flight from Wellington operated on the 29th of September 1990. The last Chathams services being flown Hawker Siddeley Argosy ZK-SAE. 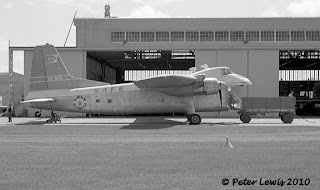 The following day Safe Air flew its last cargo flights and its almost 40 year history. In retirement, HS Argosy ZK-SAE at the Argosy Cafe near Blenheim's Woodbourne Airport... Below, a view of the interior of the Argosy passenger capsule - the inflight entertainment is new! 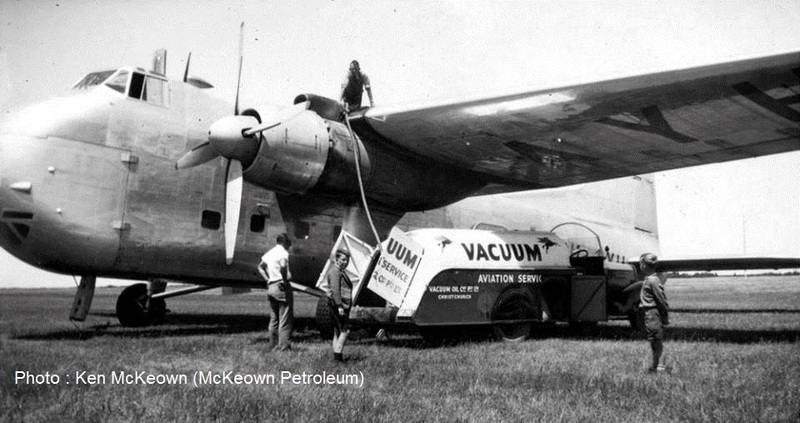 A good film about the history of Safe Air. Mainstay of the service to the Chatham Islands ZK-CIB is in for it annual and 375 hour check. As part of this there is a major phase check on landing gear and tail, hence why the rudder and fin are removed. In the meantime the Chatham Island service is not being maintained with Douglas DC-3 ZK-AWP which is also seen enjoying the sun but by Convair ZK-CIF which was in the hangar. Metroliner ZK-CIC was also out in the sun. I also finally caught Convair ZK-CIE in its all white scheme... though I am a bit annoyed with the shadow on the tail! It has been busy with the Tauck Tours charters over the summer. The Oamaru business community has shown strong support for Mainland Air's new service from Oamaru Airport. 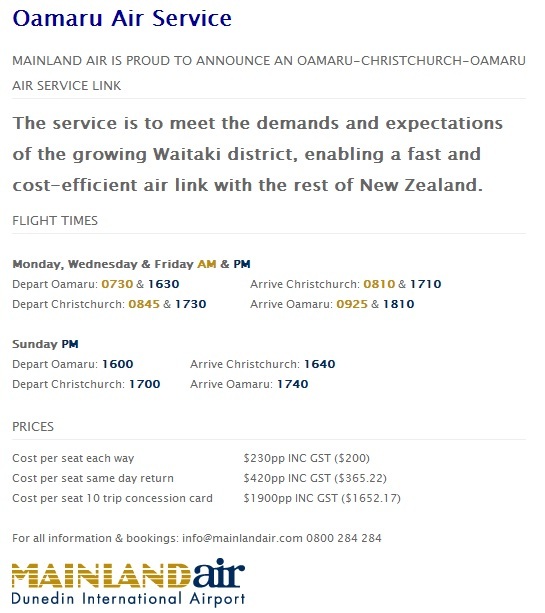 Last month, Mainland Air announced they would be launching a new service - flights between Oamaru and Christchurch - on June 4. Oamaru Airport has not been used for commercial flights since Air New Zealand's Eagle Air pulled its service in 2009. Otago Chamber of Commerce North Otago spokesman Simon Berry said from a business perspective, the new service was ''brilliant''. Mr Berry expects it to be well supported by the North Otago business community. From June 4, there will be flights on Monday, Wednesday and Friday each week, leaving Oamaru at 7.30am and returning at 9am. Afternoon flights from Oamaru would leave at 4.30pm and return at 6pm. There will also be an afternoon flight on Sundays, leaving Oamaru at 4.30pm and returning at 5.30pm. ''The scheduling is spot on,'' Mr Berry said. ''A flight leaves in the morning at 7.30am and you can be in Auckland by 10am - if you're doing that from Dunedin, you have to be up by 5am. ''The same for the evening: you can be home by 6.10pm, so you can really get a full day in Auckland or Wellington, and it eliminates four hours' drive time.'' Mr Berry said the business community wanted the service to be sustainable long term as a permanent connection between Oamaru and the rest of the country. With more access to the region, Mr Berry said Oamaru could be promoted as a conference destination. ''We'd love to see that; we've got the Opera House facilities and the accommodation,'' he said. ''It's great news for bringing people to meetings in Oamaru; they can now fly in and out in the same day.'' Mainland Air's service was a reflection of the progression of the town, he said. ''There's definitely a positive vibe in Oamaru. In the harbour area, the Farmers' Market, the historic area, it's becoming more of a destination - the tourist numbers are definitely up and the growth of the dairy sector has had its knock-on effect as well.'' A one-way ticket between Oamaru and Christchurch will cost $200. ''It's quite affordable, when you think about the time you're saving, the parking, fuel and wear and tear on your car, and it's one price, no matter if you book the same day,'' he said. Mr Berry hoped to see good patronage from the business community and families to ensure the service's longevity. Straits Air Freight Express’ first two Bristol 170 Freighters, ZK-AYG and ZK-AYH arrived in New Zealand on the 19th of May 1951. Freight operations between Paraparaumu and Woodbourne began on the 31st of May 1951. 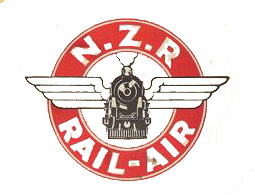 These services operated on contract for the NZ Railways Department and became known as Rail-Air. On the 19th of December 1951 a Bristol Freighter was chartered to fly a cargo of frozen products from Wellington to Dunedin. The Bristol then proceeded on to Alexandra where it uploaded cherries for North Island markets. The Bristol then landed at Oamaru for refuelling before continuing on Wellington. On the 31st of December 1951 two further Bristol Freighter flights landed at Oamaru and the first eggs were flown to Paraparaumu. Further charter flights were made and on each occasion the aircraft had touched down at Oamaru on the return flight to take on eggs as 'filler" cargo. These charter flights led North Otago interests to explore the possibility for a freight service between Oamaru and Wellington. On the 14th of January 1952 the Oamaru Junior Chamber of Commerce held a meeting to further this end. While locally there was enough agricultural produce to fly north the challenge was to be able to provide sufficient goods to fill the flight from Wellington to Oamaru in order to bring the price of the service within reasonable limits. The meeting was told by Mr F. S. Clarke, of the Dunedin commercial branch of the Railways Department, that a regular service would cost about £250 a round trip, provided goods were delivered and collected from airports. If the department collected and delivered the goods to city points the charge would be about £275 a round trip. A committee was formed to further the exploration of such a service, the committee members being Messrs G. L. McLatchie, J. S. Hogg, I. S. McDonald, T. V. Harris. and J. Craik. On the 3rd of March 1952 Mr Clarke was back in Oamaru again speaking to the Oamaru Rotary Club. He congratulated the businessmen of the town for “sticking on” with the air service project in spite of a lack of encouragement. “The service to the Waitaki aerodrome gave promise of developing into a regular one and the authorities were doing all they could, to encourage it,” he said. “Dunedin had not taken it on and so the Oamaru people had really paved the way for a regular air-freight service between the north and south. The pilots concerned had expressed their amazement at the excellence of the Waitaki aerodrome and Oamaru had everything in its favour for the development of the scheme. I think you have climbed the first rung of the ladder in air transport,” concluded Mr Clarke. The following day advice was received that a special regular air freight service was to be established between Oamaru and Paraparaumu on Wednesday and Fridays. Paraparaumu was being used at this time while Wellington’s Rongatai airport was being developed. The new service commenced operating the next day, on the 5th of March 1952. The first flight arrived at from Paraparaumu at Oamaru’s Hilderthorpe aerodrome at 2 p.m. carrying no southbound cargo but eggs for Wellington and machinery for Hamilton were carried on the northbound flight. 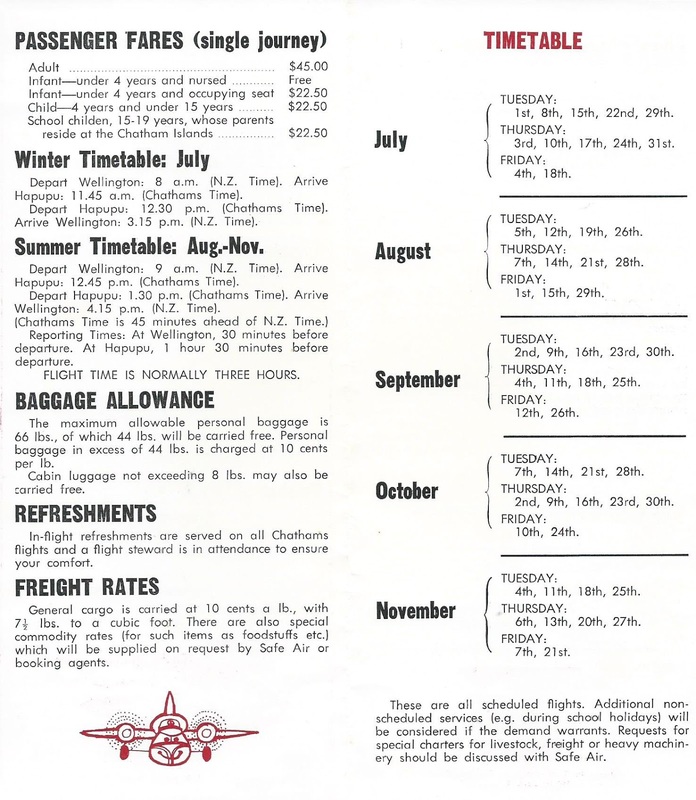 A week later, on the 15th of May 1952, it was announced that the Oamaru air service would be suspended from the following day for one month and at the end of that time it was hoped that there would be sufficient inwards freight to warrant continuing the air freight service. Arrangements had already been made to fly the entire North Otago brussel sprout crop to Wellington with the first shipment to have been flown on the following Tuesday and thence shipments of 3000 pounds each Tuesday and 12,000 pounds each Wednesday. Faced with the bombshell announcement of the cessation of the service and with the inability to get perishable foodstuffs to Wellington the Oamaru business community made representations to the Minister of Civil Aviation, Mr T. L. MacDonald asking that an interim service be provided for the perishable freight. The major problem that led to the Railway Department’s decision was the lack of southbound freight. The representations to the Minister were successful and the twice weekly service resumed on the 5th of June 1952. The success of the Rail-Air service was largely due to the cargon loading system. Realising that the size and shape of load carried by a Freighter was much the same as that carried by railway wagons and trucks Straits Air Freight Express had suggested packing each aircraft load on to a pair of removable wheeled trays called "cargons" which could run on rails mounted inside the aircraft's freight hold. Freight for the Rail-Air service was simply packed on to a cargon and taken by a truck and trailer to Paraparaumu or Woodbourne airports. 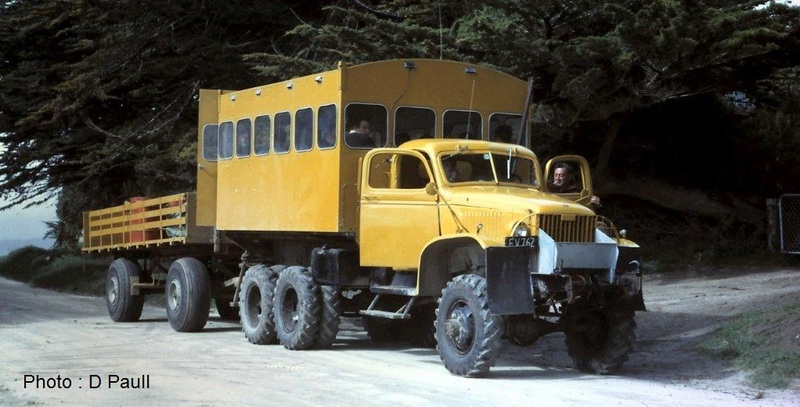 At the airport the NZ Railways Department had two special loading decks called traversers to speed transfer of the loaded cargons from the truck to the aircraft and vice versa. Each traverser consisted of a 40 foot long platform mounted on a pair of four-wheel bogies so that it could be driven electrically along standard railway tracks. It was raised or lowered at each end to line up with the tailboard of a lorry or the cargo hold of a Freighter, and had a motorised endless chain running down its centre. For loading, the traverser was first lined up with the lorry so that the cargons could be hooked on to the endless chain and, at the push of a button, dragged from the lorry on cargons on to the deck. The traverser then ran along the rails until it was in front of the aircraft its end was levelled and the cargons were fed into the Freighter's cabin in the same way. Loading was done by one man with a lorry and two trailers in 12-14 minutes compared with six men, two lorry trailer units and up to 90 minutes for hand loading. On average, the Freighters were ready to take off with another load within 20 minutes of landing. Money was saved as well as time, because the fact that loads were pushed in as a complete unit on a cargon reduced handling of individual items. It would have cost too much to equip Oamaru with a traverser so instead, by 1956, the tail of the aircraft was simply jacked up after landing and the cargons were hauled out on to wheeled trolleys. This took longer than the traverser method, but was very much quicker than hand loading. In 1953-54 the service carried 1,400,000lb of outward cargo and 875,000lb of inward cargo. Oamaru was the sixth airport in New Zealand with regard to freight, ranking after Wellington (Paraparaumu), Blenheim, Christchurch, Nelson and Auckland. In mid-July 1958 the Otago Daily Times reported that there was a strong possibility of Oamaru losing its air freight service to Paraparaumu. The key reason was the lack of inward cargo from the North Island. As the plane was flying with a lot of spare capacity the Railways Department itself made use of the available space though much of this cargo was paid for on surface rates. Poultry interests were keen to keep the service in operation and they agreed to a 3s increase for a two month period and, at the same time, to a two month trial sending half their eggs by surface means to Blenheim for air-freighting to the North Island. Subsequently the Oamaru Chamber of Commerce asked businesses to give maximum support in maintaining Oamaru's air freight service to and from Wellington especially in the matter of inward freight. One local business who did support the service was Knights Motors. The Bristol Freighter flights flew new Ford Consul and Zepher cars south to Oamaru for Knights Motors while the Egg Producers’ Marketing Organisation guaranteed two full outward loadings a week. At the same time the Chamber of Commerce emphasised that there must be a regularity of service with the twice-weekly services being maintained on their scheduled days. After being "on trial " for three months, the Railways Department announced that direct rail-air freight service between Oamaru and Paraparaumu was to be continued until Wellington’s new airport came into operation in 1959 after the situation was to be reviewed again. Wellington’s new Rongotai airport opened on the 24th of October 1959. This month, however, coincided with all available aircraft being fully committed in handling an increase in freight across Cook Strait and it was found impracticable to provide direct flights for eggs from Oamaru to Paraparaumu and freight flights from Christchurch to Paraparaumu. Arrangements were made, therefore, for Oamaru eggs to be railed to Blenheim. The increase in freight that arose following the opening of Rongotai meant the Railways Department was not to give many direct flights between Oamaru and Wellington. One such flight was flown in December 1959 and three were flown in January 1960 and these flights marked the end of the air freight service to Oamaru.